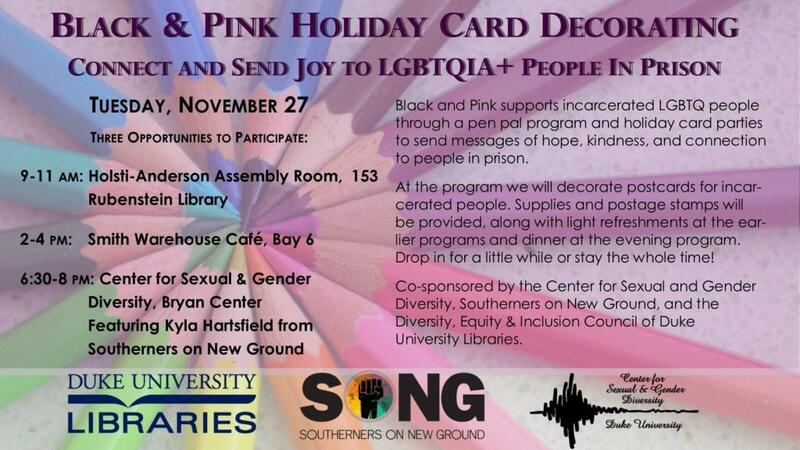 Black and Pink supports incarcerated LGBTQ people through a pen pal program and holiday card parties to send messages of hope, kindness, and connection to people in prison. At the program we will decorate postcards for incarcerated people. Supplies and postage stamps will be provided, along with light refreshments at the earlier programs and dinner at the evening program. Drop in for a little while or stay the whole time! Co-sponsored by the Center for Sexual and Gender Diversity, Southerners on New Ground, and the Diversity, Equity & Inclusion Council of Duke University Libraries.